The 2014 theme for International Women’s Day (IWD) is ‘Inspiring Change’, and we are pleased that on this day and indeed throughout Honouring Women Month the women of the Cayman Islands will be given many opportunities to participate in events that aim to encourage and inspire growth and change in all areas of their lives. There is an old proverb that states “The only constant is change.” And while we know that to be true, how often do we embrace change when it unexpectedly comes into our lives? Or do we often resist change, sometimes to our own detriment? While change can be difficult, there are many unforeseen gifts that are often wrapped in the guise of change. International Women's Day provides us the opportunity to celebrate the social, political and economic achievements of women while at the same time focusing the world’s attention on areas requiring further action. We don’t have to look too far back in our history to see how life has changed not only for Caymanian women but for women all around the world. From increased representation in politics and in boardrooms to breaking gender barriers as role models and leaders in traditionally male dominated occupations, women have made positive advances towards gender equality. However, there is still room for improvement in order to address the gender issues in many areas such as earned income, non-communicable diseases, HIV transmission and gender-based violence. On 8th March 2014 thousands of events are held throughout the world to inspire women and celebrate achievements. In the Cayman Islands, not only do we have an event planned in recognition of International Women’s Day, but there are a wide range of activities scheduled throughout the month of March as well. On International Women’s Day, the public and private sectors will come together to create an event called the Wellness of Women (WOW) Expo which will be held at the ARC at Camana Bay. The purpose of the event is to provide participants with the opportunity to focus on their own self-care and inspire change from the inside out. We encourage girls and women to make the time to attend the free classes and demonstrations, and access the information that will be available from a wide range of government agencies, businesses, faith-based, community and non-profit organisations. 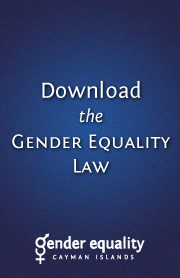 Another way in which Government is actively seeking to address women’s equality issues is through the recent request to the United Kingdom to have the Convention on the Elimination of All Forms of Discrimination against Women (CEDAW) extended to the Cayman Islands. The request is a reflection of the Government’s commitment to ensuring equality between women and men and promoting a culture of human rights in our islands. CEDAW is a core international human rights treaty that Government has yet to sign onto, and we anticipate a positive response from the UK to be forthcoming. 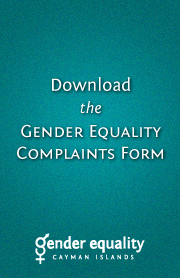 The ‘Inspiring Change’ theme encourages advocacy for women's advancement everywhere in every way. 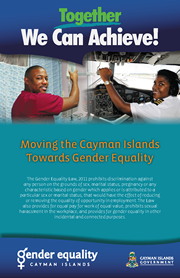 To that end, the Ministry of Education, Employment and Gender Affairs will be hosting a National Conference on Women on 29th March that will bring together women and men of differing ages and cultural backgrounds to address the social, cultural, economic and political challenges that girls and women experience in the Cayman Islands. The intended outcomes of this empowerment conference are to bring awareness about the rights to which girls and women are entitled under CEDAW; establish priority issues that will assist Government in the development of its implementation plan for CEDAW; and create a space in which to educate, inspire and empower girls and women to be ‘Architects of Change’ at a personal level and within society.